To load an originally created pic from Instagram, make sure your Instagram profile is public, not private. You'll have to enter your Instagram username and password, as well as authorise this competition to access your public pictures. To upload a picture from your phone, choose "Take Photo" or "Photo Library" on an iPhone, or select "Camera" or "Documents", then "Pictures" or "Documents", then "Gallery" on an Android phone (such as a Samsung phone). To upload pictures from your computer, select the picture from your computer to upload. Only your own creative work can be entered, so take a new picture yourself. Please do not use an existing picture created by someone else as this will disqualify your entry. This competition is open to all, including employees of Attacq Ltd & Waterfall Investment Co.
A photograph must be an original photograph of which the entrant is the sole creator of the photographic image. 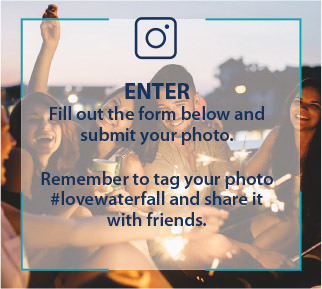 It is expressly forbidden to enter a photograph used from other sources, such as scanning or photographing another photograph into the #lovewaterfall competition. Only original photographic work created by only the entrant is eligible for entry. Entries that do not follow these rules will be deleted. 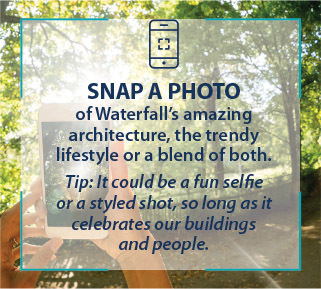 The entered photograph must reflect Waterfall content, entrants must complete the details on the online portal www.lovewaterfall.co.za to be eligible for a prize. The competition opens on 14 February 2018 and closes on 30 November 2018. By entering, you allow Attacq Ltd to use the submitted pictures for its own purposes, including marketing, advertising, social media, website and the like. No details will be passed to third parties for use. The information you provide will only be used for Attacq Ltd.
By submitting your details, you consent to your data being processed in accordance with the requirements of the Data Protection Act. All eligible entries will be judged on quality and creativity by an independent judging panel, and the best and most inspiring entries will win the prizes. Each month two winning entries will each receive a R1 000 Mall of Africa voucher. 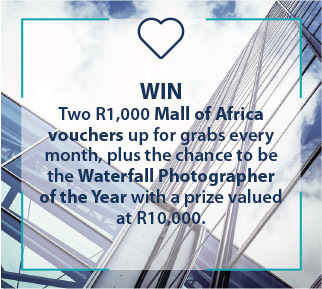 The #lovewaterfall Photographer of the Year will be announced in the first week of December and will be awarded a R10 000 mall of Africa voucher.